Note from Davonne: I’ve been amazed at how quickly this Get-Organized challenge has taken off! I’ve received so many e-mails and requests for help that I decided to bring in a few experts to help me answer some of them. Today’s expert is Melanie from Psycho With 6, and she’s a pro at organizing storage areas! Our current messy situation was submitted by Ashley! Ashley, I love that you already have maintenance in mind and want to get your husband and children involved. Because I struggled with the same problem and have succeeded in setting up a manageable system, I know you can too! First, you can get unburied from the paper clutter by dedicating time to the process. With your busy schedule, that will mean committing to 15 minutes a day until it’s done or blocking out a day or two just to go through papers. 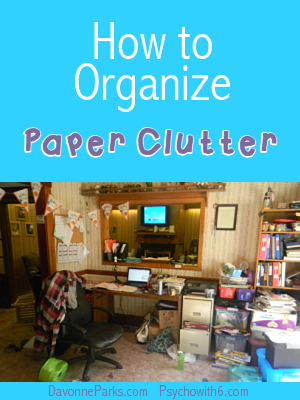 I love Davonne’s tips for quickly processing paper clutter. If you have any financial papers, you’ll appreciate the list of how long various papers should be kept. Remove all paper clutter from your office area at once. Everyone can help with this! Put it into boxes, so you can clean the space immediately. Then you will be motivated to continue. Later, you can work on one box at a time, even while watching television if you like. Recognize that paperwork such as owners’ manuals rarely need to be saved today because they can be found online. Eliminate paper by putting items aside to be scanned. Unless you must have a paper copy, consider using Evernote or apps like Turboscan if you have a smart phone. The originals can then be recycled. Take pictures of children’s artwork. The artwork will quickly fade and become fragile, but the picture can last forever. These pictures can be incorporated into a photobook or calendar like this example on Snapfish. Let your family help you. After talking with your husband about what you want to keep and what you don’t, he can put a large amount of paperwork in the trash for you and create a small pile of papers for you to decide on. Children can also identify their favorite papers or artwork that they would like to be scanned as keepsakes. You may need to set a number limit for children who are attached to papers. Once you’ve eliminated the paper clutter, it’s time to set up a system for organizing the papers you’ve kept and for keeping new papers from becoming clutter again. First, organize papers by category. Use as few categories as possible. I like to use sticky notes and a table for this. Put the item in the first category that occurs to you. When you’re done sorting, you may decide to collapse some categories and expand others. Second, decide how to store papers. You have a lot of bookshelf space, so binders may be ideal. I love pretty spines on binders, so these free printables may be just the thing for you! I love using a portable label maker for quickly adding the title of a binder if I don’t want to take the time to print something pretty. You also have the option of assigning each category a color to make retrieval of the right one easy. If you decide to use binders, either load the binders with clear sleeves that papers can be slipped into or make sure you have a good three-hole punch easily accessible. You want to make it as easy as possible to keep up with your system. The approach that I recommend doesn’t involve lots of tabbed sections in your binders. Instead, put the newest papers on top. Finding what you need will be a matter of flipping through the right binder. If it was recently added, it will be easy to find. Keep binders in order with the most recent binders on the top left. Alternately, you can choose hanging files. I have made the mistake of creating complicated filing systems that I never kept up. I finally got the idea to use wide accordion-style hanging file folders in various colors. I keep them in crates under my sofa table and archive them into filing cabinets. If we buy a new appliance, I just drop the sales receipt and warranty into a wide green folder. When I need to find it, I look for it in the front green folder if it was a recent purchase. This approach saves me so much filing time and I am still able to locate papers quickly. I store children’s papers in traditional hanging file folders labeled by child and grade. I have a school tote with files for this school year. A portable tote or black file case like the one I see you already have would be a great location for storing kids’ papers from this year if you choose the file method. Third, create an inbox for papers. You have limited desk space, so I recommend using a wall inbox to the right of your desk. If your desk is not close to the entry point for most of your papers, you can also create one for short-term use in another part of the house. Explain to your family that when you, your husband, or children get mail or papers from school or meetings, all of it must go into the inbox. Finally, create a routine for processing papers. Only you know how often you need to go through incoming paperwork so you won’t miss deadlines. Decide if you will process daily, weekly, or when the inbox is full. Set a reminder on your phone or calendar to prompt you until it’s a habit. If you explain how things are filed, the whole family can help out. Looking forward to seeing your office paper clutter-free! Be sure to read Davonne’s book, Chaos to Clutter-Free. Dr. Melanie Wilson has been overcoming clutter for 14 years. She is a psychologist turned homeschooling mother of six, sharing sanity-saving ideas for homeschooling and living at Psychowith6.com. I know this article is a little older, but I just came across via Pinterest today. I clicked through because I am in the process of working through an online course that also deals with this topic (a couple reviews are on my blog) and also wanted to share that I love Melanie’s site URL – we have 6 kids also – they are all girls. Have a great weekend! Christine, six girls sounds like a lot of excitement (and like you could never have too many bathroom sinks). Good luck with your paper clutter!